on how happy it makes my office. 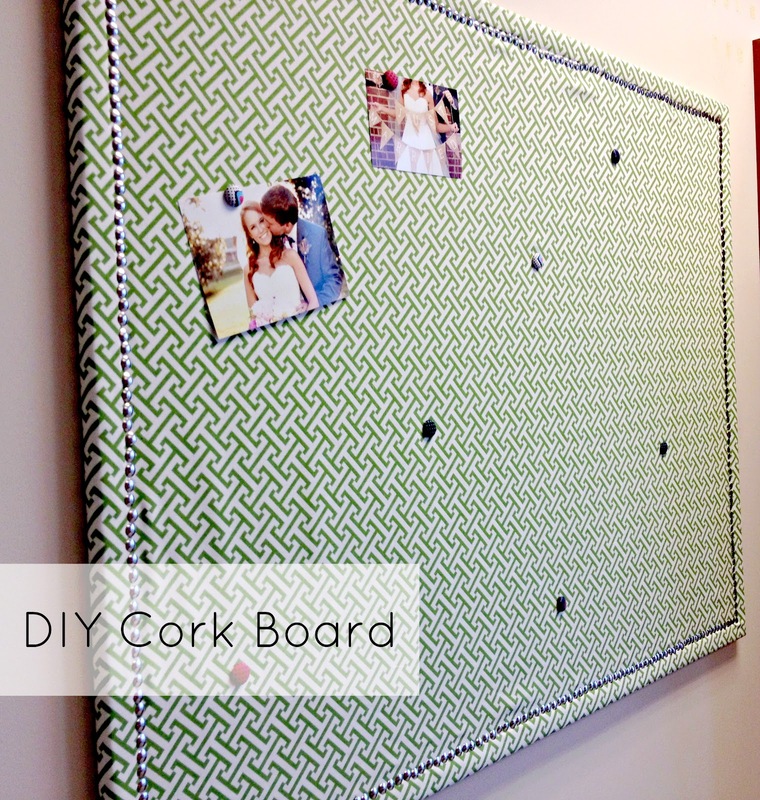 Cover your cork board with fabric, leaving several extra inches to wrap around. Start pushing in your tacks. This is the hardest part, so you may want to have your husband do it for you. Matt’s thumb ached for days after pushing in 350 tacks – that’s true love, friends. 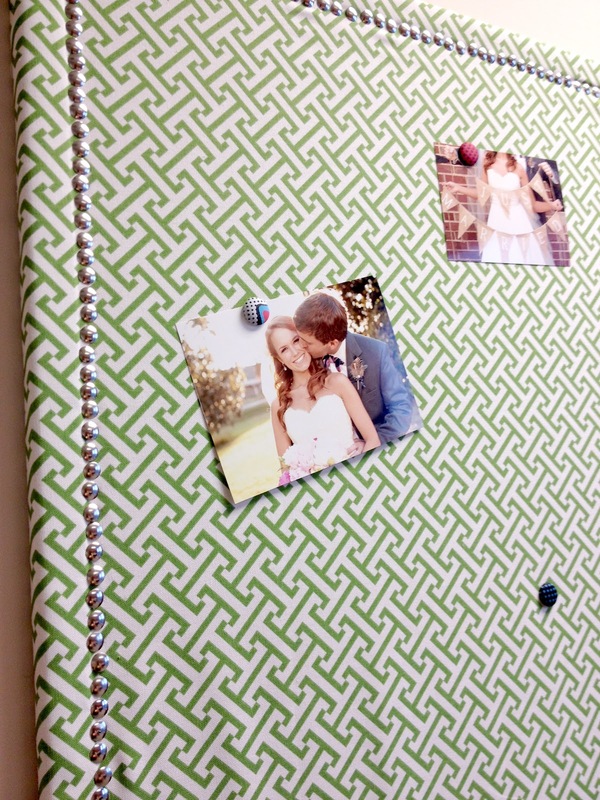 Once all your tacks are in, flip your board over and staple the fabric down on the back side. Add pretty push pins and hang! TA-DA! Hope I can keep it pretty as it fills up with work stuff! So pretty! Love this Christina! I did something similar at my old apartment but it was not nearly as nice. Am also in the middle of prettifying my office. Heres to increased productivity. Hopefully? oh man! i love your craftiness…i so want to do this for my office. my cube is struggling. It turned out awesome! I always call in husband help if it involves removing staples or something tedious like this! I love this! I love the fabric you chose and yalls cute wedding photos up in your new office! LOVE it! I think I now know my first maternity leave project! Adorable! I love how he helped you too! Yall love decorating each other's offices! It turned out awesome! I am in the process of doing ours for our home office! I can't wait to see how it will look! That looks so good! 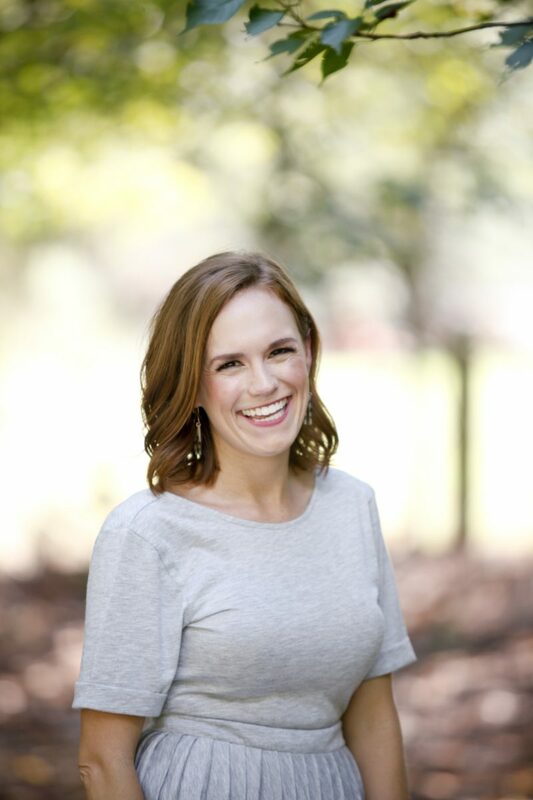 I love your blog and style! So many cute ideas. New follower just started my blog over the weekend. Excited to meet other bloggers. That is such a neat and pretty project! love how it turned out and the fabric is lovely. Love it for home too! sooo cute! i love the push pin idea! I'm going to have to try this one! I'm totally doing this. I heart you. Thanks for the idea!!!!!!! I'm staring at a big, blank all in my home "office" (not like I do any true, official work out of here like I used to, but whatever!). THIS is just what it needs. YAYYYYY! Love your choice of fabric. I plan on doing the same for our office/craft room. I love that print! Thanks for the DIY details, it turned out great!! So so cute! Love the fabric you chose! Green is my fav. What a sweety pie hubby.